All across Wisconsin, groundwater plays a vital role. It supplies our abundance of lakes, rivers, and streams. Many people rely on it for their daily water needs. Groundwater is essential to the well-being of our communities, our economy and our beautiful waterways and wetlands. The Central Sands, however, has a critical shortage of groundwater. Many lakes and streams have been drying up, and some have disappeared completely. Some families are finding their wells tapped out. 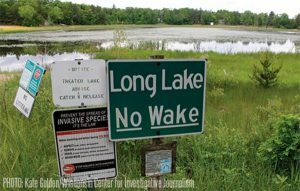 Meanwhile, the Department of Natural Resources approved permits for high-capacity wells–those that draw more than 100,000 gallons of water per day–despite scientific evidence that these proposed wells negatively impact nearby lakes and streams. Clean Wisconsin is at the forefront of efforts to protect groundwater in the Central Sands. In 2016, Clean Wisconsin filed nine lawsuits against the DNR for issuing high-capacity well permits without accounting for the impacts these wells would have on surrounding waterbodies. Clean Wisconsin asserted that the state agency is abnegating their constitutional duty to protect the waters of the state for the people of Wisconsin. Our water belongs to everyone in Wisconsin, and there are many people–those whose private wells have run dry, those whose lake homes are now without lakes, those who long to once again fish for trout in diminished streams–who rely and depend on strong protections for our water. We’re honored to represent the interests of the people of Wisconsin who care about clean and plentiful water for all. On October 6, 2017, Dane County Judge Valerie Bailey-Rihn for the Dane County Circuit Court heard oral arguments in this case. On October 11, in a major victory for Wisconsin’s waters, Judge Bailey-Rihn ruled in Clean Wisconsin’s favor. She nullified the inadequate high-capacity well permits, requiring the DNR to fulfill their constitutional duty to protect Wisconsin’s waters by considering the impacts these wells are having on rivers, lakes, and streams. For more information, see our press release on the ruling, Judge Bailey-Rihn’s October 11 ruling, and our filed petitions below. We’re working hard to preserve our groundwater. Want to help? Join our Action Network.